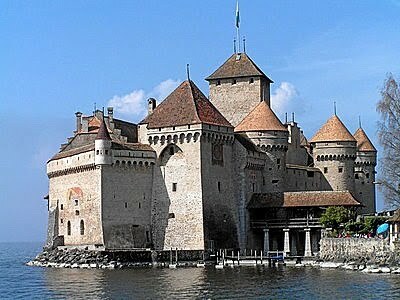 Château de Chillon is a castle, standing on the shore of Lake Léman in Switzerland. It built up around and connectiong one hundred smaller buildings. The oldest parts of the castle have not been dated, but there are written records about it dated as far back as 1005 AD. The castle has never been conquered, but it has changed owners several times through treaties. One o the greatest expansions of the castle was made during the 13 century, under the rule of Pietro II. Today the casstle is open to the public, for a small fee. There are tours offered, and one can see several recreations of the most important rooms within the castle. It is also convenient to get there by public transportation.